Jesus Without Baggage | For those attracted to Jesus but not to the baggage often attached to his message. Jesus without Baggage is for those attracted to Jesus but who question the baggage often attached to his message, so it has two large areas of focus. The first area of focus is examining major harmful baggage issues that often detract from following Jesus freely. The second is learning who Jesus is, what he says about the loving Father/Mother, and how we should relate to God, to ourselves, and to others. I grew up a fundamentalist and later became evangelical. As I examined my beliefs, I discarded a lot of baggage that was added to the good news of Jesus, and I hope to help and support others who are on a similar journey. If you are concerned about unreasonable baggage (rules and beliefs) often associated with Jesus, then this blog is for you. It is a message of Jesus without baggage. 1. First and foremost, this blog is meant as a support for those questioning beliefs they have been taught as true or even essential. This is often an extremely frightening process, so this blog is a safe place for interaction, questions, and support. Those escaping religious baggage sometimes abandon Jesus along with it and really feel the loss. 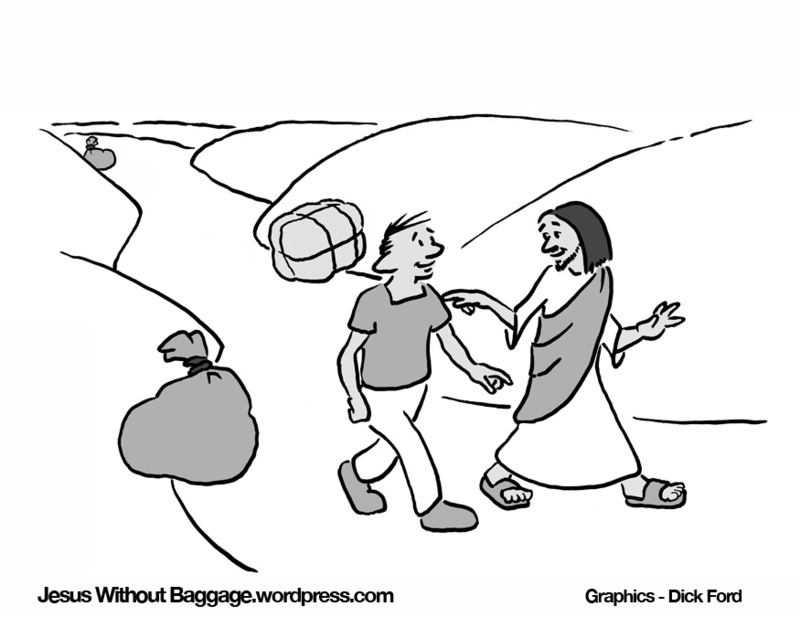 We are here to say that baggage is not part of Jesus’ message to us; you can certainly follow Jesus without it. I don’t claim to be an ‘authority’, and I certainly don’t want to become an authority figure to replace authority figures people are escaping. I believe everyone should decide issues for themselves, but I am pleased if this blog provides information and help on your journey. The regular readers and commenters also give a great deal of support. 2. The second intended audience are those already on a spiritual journey from religious baggage and would like confirmation or conversation from friendly co-travelers. Readers here interact freely with me and with other readers. It is nice to be part of a community of like-minded persons, especially when you might not have that in your local area. 3. Finally, this blog is for those interested in Jesus but not the traditional baggage often associated with him, whether or not they identify as followers of Jesus. It is also for those who simply enjoy discussion and interaction on these important topics. Let me make a clear statement. Many traditional believers and many atheists will disagree strongly with my views, but my purpose is not to persuade anyone to accept my perspectives on Jesus, God, or the Bible. I am happy if my understanding of Jesus without baggage makes sense to you and is helpful; but it does not bother me in the least if you don’t agree with my understanding. I respect your right to your beliefs even if you disagree with everything I think. Since the death of Jesus’ earliest followers, certain views have become accepted as ‘truth’ and those who disagree with these ‘truths’ are often excluded from the Church and are no longer considered part of God’s family. This is baggage. I was raised a fundamentalist, which is an extreme form of evangelicalism, and I fully embraced Jesus at a very early age and accepted a lot of religious baggage along with that choice. Over time, I discovered that much of the baggage I accepted was not legitimate. I first abandoned legalism–the keeping of religious rules, but I also dealt with other baggage that came as part of my religious tradition. However, I did not abandon Jesus. I still find the person of Jesus, as described by his earliest followers, intensely compelling. He resolves my alienation from God, myself, and other people, and he provides eternal life in his death and resurrection. Jesus is the most important thing in my life. I accept his invitation, and the invitation comes without baggage. These views are not only misguided, but they create burdens instead of freedom and are harmful to our relationships to God, ourselves, and other people. We discuss these and other issues, and their ramifications, in this blog. Religious baggage is not the only important thing we discuss on this blog. Opposite to the baggage is the Good News of Jesus. As we begin to learn and live the good news of Jesus, we no longer need (or want) to hold on to our baggage. 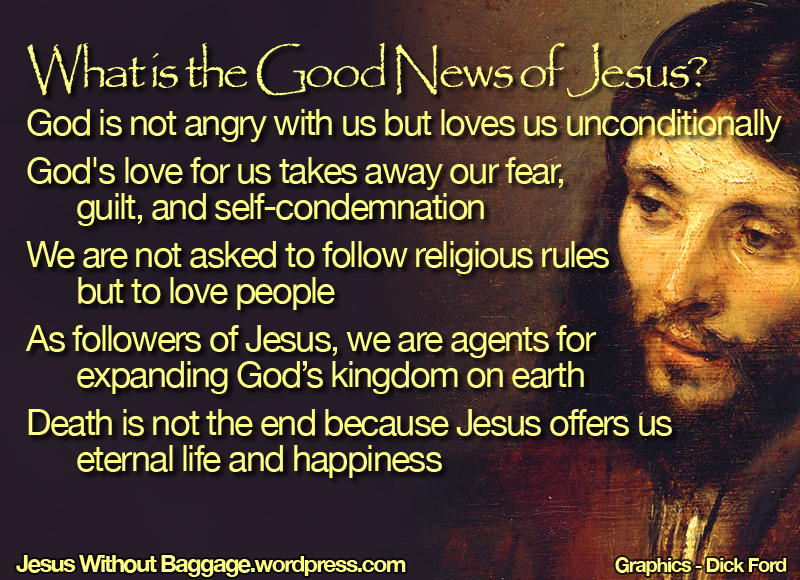 Here are a few posts on the Good News of Jesus. If you know someone who might find this blog helpful, feel free to share this page with them below. Heather, count me in agreement with you. The Bible was written by men, and they wrote it to favor males. There’s a whole lot of confusion over who wrote a lot of it and how it’s been morphed and merged by those who selected & edited it. You’ll also notice writers just wrote; they didn’t all say, “This is the inerrant word God spoke to me!” It’s a later development of man to claim that. I remember as a little Southern Baptist kid being told in Sunday School that people who wrote the Bible were overtaken by God’s spirit and sorta wrote under his spell or in a trance. Uh-huh, sure. I seriously doubt God has genitalia, so classification of him/her as male is just another way male writers & editors exploit scripture to benefit men & keep women in their place. About 40 years after my early indoctrination, while in counseling, my eureka moment was when I realized that I had an impression of God as pretty much a mean SOB who loves to see people quake in their boots and just looks for excuses to slap people around (he even loved to wipe out whole civilizations; what’s not to like about that!? ), while Jesus looked for every opportunity to show love & compassion to humanity. My best guess is that Jesus is the best reflection of what God’s like, because if I’m created anywhere close to his/her image, that must be why I love showing my kids compassion and don’t enjoy being mean to them. I was raised to salute and ask no questions. I’ve since learned that anything worth believing is strong enough to withstand my questions. Anything that people don’t want you to question generally needs to be questioned. hope you all are fine i live in Afghanistan i would like change my religion come to you Christian religion so if i do this act here i cant live easy because we have no right change religion in this country please help me what should i do can you take my hand to go out? Hello Wahid, I am sorry for the delayed response. What I understand is that you would like to become Christian instead of your current religion but are forbidden to do that in Afghanistan. And that you would like assistance to come to America. Welcome, brother! Some Christians feel they have to tell everyone that they have become Christian, but some who live in places where that could be very dangerous they choose to keep it to themselves unless they feel the Holy Spirit of Jesus telling them specifically that they should share with a certain person who may be ready to receive the Good News. I know this is no small thing. It is easy for us sitting here in freedom. But start by talking to Jesus in your head. If you are able to use a Bible read Matthew, Mark, Luke and John. I’m sure you have seen on this blog that following Christ does not mean you need to follow certain rituals, its means that you love Jesus, that you talk to Him and your life is about being so grateful for the gift you were given by Jesus that you end up trying to be like Him. We are sorry for the images of Christianity that are often on American media. They have used Christ to get more power. That is the opposite of what Jesus is about. Read what Jesus said and did when He was with us. I don’t know how you found out about this blog, but I am so glad you did! Please let us know how we can pray for you in your new faith. I know when you start communicating with the God who harms himself in order to save us, you will start to know in your heart what to do. One Muslim woman I read about baptised herself in her bathtub because she was in so much danger but she really felt like she should do it. Your daily life will look different than ours even though you have the same faith. Remember, friend, God is for you. He loves you. He knows how hard it is for you. Well said, Dean! Very well said! Thank you! This is just what I need, a confirmation of my instinctual understanding of God and immortality, and the love of Jesus AND God for all humankind. You have also challenged me not to accept the status quo? But to ask questions, & really think about whether the answers make sense to me! Vicki, you are certainly welcome. I am always happy when I have been helpful! Have a great day and a great journey! Thank you SO much for this! I remember, as a teenager in our Youth Fellowship group, asking the question: “What is the minimum I need to do to be a Christian?”. I never received a satisfactory answer – people thought me strange, I guess. What I was really asking was the same question as I think you ask: “Do I have to accept all the baggage that Church attaches to the Christian faith journey?”. Forty years later, I am still struggling with many issues: Why can’t I preside at Communion as an unordained person? Where in the Bible are the marriage vows and, indeed, if the marriage vows WERE taken directly from Scripture, would they still be relevant today? As a divorcee, I will never get over the fact that I didn’t manage to fulfill that passionately uttered and sincerely meant “till death us do part” and, as a result, have been unable to say those words again to my partner of some 17 years. And, don’t get me started on the gay issue!! Susan, I am glad you found the blog and seem to like it. I think you ask great questions. “Do I have to accept all the baggage that Church attaches to the Christian faith journey?” Great question, and one that needs an answer. Why? Why? Why? “Why can’t I preside at Communion as an unordained person?” Great question and practical too. In my opinion any believer can do functions that are often limited to the ordained; I don’t think the very early church had these distinctions. “Where in the Bible are the marriage vows and, indeed, if the marriage vows WERE taken directly from Scripture, would they still be relevant today?” Great questions. How do mere traditions seem to become church doctrine? “And, don’t get me started on the gay issue! !” I am with you there! I hope you continue to enjoy the blog, and feel free to join the discussion whenever you wish. Just stumbled across this blog and it truly is a breathe of fresh air and I agree w hole heartedly with what you’ve said and I think it’s filled with the Love of Christ. Welcome to the blog, Bill. I am glad of two things: that you like the blog and that the love of Christ comes through! I ask the questions teaching Sunday School and see the rolling eyes. I like the loud music. I think the ritual is silly. The Bible has problems glossed over. Most importantly, if the Bible means something different to everyone, does it really say anything in stone? Know the feeling, William. I don’t ask questions out of meanness; I just wish we could look for truth. Instead, many church folk only want to hear affirmations for what they already believe, much of which is indoctrination & tradition instead of what Jesut said. William, as a former SS teacher I understand the eye-roll. I had the advantage of classes that were somewhat open to new ideas, and I was careful not to push too far; but I did sometimes get those eye-rolls and worse. “Well, it doesn’t say God told him, but I’m sure God did since that’s what David did.” Lilly, I am afraid that is not much of an answer is it? By that same standard, I guess said SS teacher would believe that God told David to take Bathsheba and have her husband killed..Since that is what David did. Since learning of many family members ‘coming out’ through the years I too have questioned my beliefs. With sincere thoughts of difference I have left the evangelical church. I love my family and want them to feel loved too. I cannot attend a place of worship that will exclude them. Recently I encountered an old friend, now minister of a Presbyterian church. It sounds like he is trying to enlighten those within the church to open their minds to accept the LGBT community. I am new to this forum, is their something you could suggest for me to send to him to read. He is caught between two worlds of thought. Ann. PS Do you try to worship in a church anymore? Ann, I am sorry for the delayed response. Let me say that since I embraced the LGBT community I have found that there are many gay-affirming churches. If you live in the USA or Canada, here is a list of gay-affirming churches by state or province. Hopefully there is one close to you. Let me know if I can help further, and feel free to continue this conversation. I am so glad I found this information. I have been searching for a church that will not preach to my 7-year-old daughter about her “sin” and how “naughty” we are and must be saved from ourselves. She’s seven! She’s having bad dreams and low self-esteem from being taught about all the horrors in the Old Testament. I want her to know the love of Jesus, to develop a relationship with Him, trust him, and to know that she is unconditionally loved. Does such a denomination even exist? I am really serious…..I want her to grow up in Christ without being afraid of Him and feeling guilty and worthless as a ‘sinner”. We’ve tried different churches, but haven’t found the right one yet. Any suggetions? Vanessa, I can really identify with what you are saying. I was still going to conservative churches when my son was growing up and really resented the things they were teaching him. Fortunately, he had considerable counter-balance at home, but if I had it to do over again–I would not allow the church to do that. Some denominations are more open than others, but no denomination is consistent among all its congregations. Even the most progressive denominations have some conservative churches. Some typically non-conservative denominations are United Church of Christ, Disciples of Christ, Evangelical Lutheran Church of America, and Presbyterian Church (USA). However, there seems to be another element that is a predictor of more open congregations–are they gay-affirming? I don’t know where you stand on LGBT issues, but those churches who are open to LGBTs tend to not have the conservative, indoctrinating cultures you describe. But isn’t that what Paul was all about–that we are all sinners sinners sinners and that we must be saved from this horrible condition. I find that claim absurd. I think the main reason I am not a Christian is that I don’t believe the problem exists that the Gospel was meant to remedy. Steve, I agree! I don’t think we are all sinners and must be saved from this horrible condition: I don’t think this is the point at all. The somewhat common idea among some Christians that we are sinners and must be saved from hell is one of their most harmful beliefs. Rather, I think our condition is that we experience fear, brokenness, and alienation; and God wishes to bring us peace, healing, and reconciliation. I also believe Jesus’ resurrection was a defeat of the final power of evil and death. I think Jesus’ message and example of the good news (gospel) is that we concern ourselves with treating others with genuine concern (empathy, compassion, and care) rather than being absorbed by a legalistic avoidance of ‘sin’. I think all ‘sin’ is is hurting ourselves and others. I’m curious, then, to understand your relationship with the New Testament. It says in many places that either you believe in Jesus Christ or be condemned. How do you deal with that or other passages that you don’t embrace? It sounds to me like you accept Paul’s view on the Law. Paul is so out of the major streams of first century Judaism. If you really make an effort to understand the primary thrust of Judaism, Paul looks more and more strange. Also, earlier in Judaism, there were different strands within Judaism. But compassion, love, forgiveness, and caring for the poor, the widow, the homeless, and the hungry are all Jewish values. More generally, the task of the Jew is “tikkun olam”–to heal, repair the world through justice, righteousness, and mercy. I don’t think the teachings or instructions (Torah) help avoid sin any more than our U.S. laws enable one to avoid sin. And the love of Jesus or Christian love in the world have certainly has not healed the world. If you mean by ‘Paul’s view on the Law’ that Paul did not think we are any longer bound to the Law, then you are correct. I do not think we are bound by either the OT law or any sort of legalism. I agree with you that “the love of Jesus or Christian love in the world have certainly has not healed the world.” This is partially because the good news of Jesus has been misunderstood and corrupted; but I would say that, while Christian love has not healed the world, it has healed many individual people. Very interesting blog. Thank you. If I could add my two bits you may want to read the testimony of a family that left church and followed Jesus into the wilderness here http://www.homerlesandwandaring.com. They live what you are talking about. Thanks, Kevin. I will try to read it very soon. Kevin, I did check out the book you suggested. It seems to be an interesting one; thanks for sharing! Thank you so much for making this blog. I’m a young teen who’s been struggling in my faith walk for a while because of the exact reason you describe here! The fact that I found this exactly when I was at my lowest in my faith really makes me think that God may have led me here so I didn’t have to struggle so much! Dimitria, I am glad you found the blog helpful. Let me know if I might help with anything else. Sorry for the delayed response; I was without my computer for more than a week. I like your thought process of Jesus without baggage. I believe Jesus does not want us to have any baggage. Baggage that our cultures have feed us over the years because they did not know any better or it is how it was always done. We are all a product of our cultures until we take steps to change the way we think. I have been on a journey myself to discover and know Jesus, God the Father and Holy Spirit in a more Loving accepting relationship. I understand that Jesus greatest gift is the Love He showed us by willingly dying on the Cross, something God the Father requested of Him and in dying Jesus expressed God’s unconditional Love to each of us. We come as we are and are accepted as we are, with all our baggage and in the process we are changed and gradually release our baggage and can then reflect this same unconditional Love to others. I am still a work in process but it feels good to know God Loves me just as I am!!! LuAnna, I am glad you like the blog. And you show a lot of good insight! “We are all a product of our cultures until we take steps to change the way we think.” I totally agree. And: “We come as we are and are accepted as we are, with all our baggage and in the process we are changed and gradually release our baggage and can then reflect this same unconditional Love to others. I am still a work in process but it feels good to know God Loves me just as I am!! !” Well said! Hey guys, sorry I haven’t kept up with your comments the last few days. I was unexpectedly without my computer for more than a week. Hi Tim, I’ve logged into my wordpress account for the first time in 2 years just to say that I appreciate this blog and that you’re doing a good job. I just wanted to quickly share with you some of my journey as well. I’ve been in the Pentecostal church all my life and while my churches haven’t been fundamentalist by any means, in the last 12 months or so I found myself strangely discontent about a lot of the doctrines I’d been taught as a child. After doing some personal study on ancient history I realized that the idea of Biblical inerrancy was making less and less sense. I found out that the texts aren’t as ancient as church leaders had always claimed they were, that they had been compiled from different strands and oral traditions and edited over time by religious reformers, that the book of Genesis was in many ways a reaction to even earlier texts, and that many events described in the Old Testament probably never happened. I was beginning to wonder if the Bible isn’t the “word of God” then does faith make any sense at all? After all, people like Zarathustra and Mohammed also claimed to hear from god. But I also went back to the gospel of John and I found that I was moved by the story it told and by the teachings of Jesus. I began the long process of sifting through what I believed because of Jesus and what I believed because of religious tradition. I came across your blog sometime while I was researching the doctrine of biblical inerrancy and it helped me to think through a lot of things that I was questioning myself. In the last few months I’ve given up a lot of beliefs I used to think were very important; not only Biblical inerrancy, but the idea of hell, the doctrine of penal substitution, original sin, the devil. I confirmed my long-standing suspicion that Revelation is not in fact a prophecy of the end of days. To be honest I’m not even that convinced by the doctrine of the Trinity anymore, but that’s neither here nor there. Since I’ve come to these realisations I’ve felt a strange paradox; that somehow I feel less “spiritual” than I did in the past, yet I’m also somehow more like the man Jesus wants me to be. I’d describe my faith as more mellow now; hardier; more robust and basic. I don’t pursue ecstatic spiritual experiences anymore, but the message of Jesus seems more real than ever. I’ve even felt like I’m more in line with Jesus’s teaching since I stopped giving all my donations to the church and started giving to charitable causes, despite what I’ve been told in church all my life. One thing I can say confidently now is something I think I read on one of your posts. My faith is based solely in the message of Jesus, nothing more and nothing less. Wow! That really resonates with me. I have been attacked to within an inch of my life on the Premier UK Disqus forum recently because I don’t preach the wrath of God!! Apparently, just showing God’s love and grace is “wishy-washy”. When I evangelise, I am supposed to be offensive, apparently! Back in the days of St Paul, the term “Christian” was a jeering term of mockery. Today, it is regaining that same association because of the loud voice of radical fundamentalism and that is so sad. I now call my self a person of faith, rather than “Christian” as I don’t want to be associated with the damaging connotations that the word now represents. Like you, I now feel I am on the right path, in a very quiet and mellow way. Like most people, I have had my fair share of challenges and tragedy and my (very basic and honed) faith has remained solid and intact. I’m not a loud or dynamic personality but I know, from feedback, that being real, as well as loving and constant, having Christian integrity all go a lot further than loud and repetitive proclamation of cherry-picked Bible texts (most of them used out of context with 21st century western civilisation). Susan, I am glad you are here with us–those who are on the journey! Thinking Man, you are a person after my own heart! You have had quite a journey, and I am sure you are much better for it; I had a similar journey. I love your statement: “I also went back to the gospel of John and I found that I was moved by the story it told and by the teachings of Jesus. I began the long process of sifting through what I believed because of Jesus and what I believed because of religious tradition.” And you are right–my faith is based solely in the message (and person) of Jesus, nothing more and nothing less. I even think it great that you are giving to charities instead of giving blindly to the church. I hope to continue to hear from you to whatever degree you might wish. Happy journey! Miriam, I’m glad you found the site as well and hope you like it. I know what you mean about “it’s sometimes still hard to shake my negative beliefs as they have been so deeply ingrained”. This is the way we fundamentalists were taught: ingrained, indoctrinated, and constantly warned against questioning. Of course the result is fear. I believe in God and always have my whole life, don’t know why in particular as I although I went to Sunday school and my parents both belived too we never really spoke about it much certainly not in a fearful way at any point, I think we all just had a happy acceptance and inbuilt simple belief. I have lived my life pretty much free from any fear involving my faith in God the very concept of being afraid always struck me as strange as how or why would people fear someone who has given us life and everything else, including free will to simply be ourselfs. I have always believed we all go to heaven one day although I have never been quite sure how it all worked exactly and in truth I never really had the greatest need to know, I was just happy accepting all would be known and understood one day and when that day came for us all everything would make sense. To cut a long story short about 4 years ago I met some people preaching fear, it’s not the first time I’ve come across people who say such stuff but for the first time ever I took it in a bit and worried about their words ( looking back I probably wasn’t in the best place mentally at the time) and what followed was years of confusion ocd fear worry anxiety guilt about everything to do with my faith. Fear is a very very powerful weapon and once you get inside people’s heads and make them afraid they are in trouble mentally for sure, I searched the internet for reassurance that all was ok but just found a lot lot more fear from Christians who even claimed my every thought was known and judged, well apparently we have around 150,000 thoughts per day most of them negative so trying to make sure I didn’t think anything unkind horrible or disrespectful in way and panic praying if I did wasn’t good for my physical or mental health in any way shape or form. I have always known deep inside me this fear was wrong and allowing it to take over my mind leading me to panic praying was more disrespectful than any thoughts I have ever had in my life but I had developed ocd and was having intrusive thoughts I didn’t mean but the more I panicked and apologized for the thoughts the more frequently they came into my mind, apparently this is how ocd works the more notice you take of your negative unwelcome thoughts the stronger they become and the more often they happen, panic praying umpteen times a day is horrible because not only is it mentally and physically exhausting it feels so disrespectful towards God just doing it. Especially when every mistake in every word within the prayer really matters, thats ocd, not nice at all. My heart was telling me relax trust in God’s unconditional love understanding forgiveness compassion kindness but my head was screaming you’ve made a mistake you must put it right or terrible consequences will follow for you and those close to you or God will punish you if you don’t apologize immediately, its horrible way to live. The battle between my heart that is and always has been full of happy faith and my unwell mind that had become full of fear has been going on a while now in varying degrees of intensity and I have feared I would either go insane or lose my faith completely as my only escape route. I found the strength to open up to God and say I didn’t believe in all this fear stuff and I begged him for the strength courage wisdom and will to help me overcome my fear worry anxiety guilt and ocd confusion and get back to being much more like my old self again, my old simple happy faith and my old relaxed relationship with God himself that didn’t involve fear in any way shape or form. Slowly but surely I truly believe I am getting better and returning to my old self again and it feels fantastic to be able to think say or even do as I like again without fear of constant judgement of my every thought word and action. I feel free to be me again and trust myself again and accept my imperfections again because in my heart I always always trusted God niether wanted or expected perfection from me, it was only the fear that wished to control me that demanded perfection from me. I would like to thank you all for sharing your own stories and experiences on this site as reading how so many of you who were born and raised in the culture of fearful faith managed to not only brake free from all the fear but come out of it with your faith intact has given me so much hope and inspiration to belive I could get back to my old happy self with my old happy faith right where it belongs. Thank you everyone because alongside another couple of sites that made me understand what ocd is and exactly how and why we have it you have all given me strength on this part of my journey. Fear maybe a powerful weapon but fundamentally its a pretty weak one that seeks to control people simply because it knows it can not allow them to think freely or allow true freewill because it knows no one would freely chose to live with fear if they could see it for what it truly is. Happy, thanks for sharing your story with us. I am glad you are losing the fear that you received from those who were preaching fear. I agree with you that we should not fear God or that we are going to be judged harshly by God. Indeed, God is love and is not angry, harsh, and vindictive toward us. I don’t understand what u mean major baggage issues cos the bible clearly States that God is angry at sinners everyday and that is because God is Holy and I realised many people have a hard time understanding God is he holy. And hell is eternal punishment that’s what the bible says and Jesus said go make disciples baptising the in the name of the father the son and holy spirit…he continues by saying teaching the to observe all I taught u what did Jesus teach the sermon on the mount. Matt 6. 1cor 6 no homosexual will inherited Gods kingdom. If u feel like u don’t want baggage I got some baggage for u…carry your cross deny yourself and follow Jesus! take off your blinkers, Gotfried, and see our God of perfect love, grace and forgiveness. He doesn’t want us following Him out of fear, but out of love and gratitude. Lots of folks are raised in religion that teaches God is vindictive. It’s a great way to control people & squeeze $ from them. Many parents also use such religious overtones in their parenting. Result? Kids past & present who cannot grasp God’s love & are addicted to the need for a harsh heavenly father who’s made in the image of pastors and/or parents in their lives. Been there, done that. Not fair to ourselves or God, especially as revealed in Jesus. Not angry at those who still feel that way, but feel great empathy. I struggle to feel your empathy. I was raised by parents who motivated me by a curious mixture of love and guilt. They meant well but they screwed me up good and proper and quite possibly damaged my ability to achieve my potential in many aspects of my life. I still sometimes feel it impossible to believe that I am truly loved, either by God or my nearest and dearest. I have made so many mistakes, hurting good people along the way, whilst searching for that relationship of unconditional, forever love. It was there all along in Jesus! No, I can’t feel empathy, just anger at the widespread hurt that this attitude causes – and all supposedly in the name of God! Ironically, those parents of mine are now 89 years old and clearly adore and value me to the uttermost. I wish they could have shown me that love when I was being formed as a young girl. Susan, no criticism for you from me. I understand. I remember in my dad’s later years as he mellowed, I asked one day, in a somewhat confrontational way, why the harshness in my youth. He seemed at a loss for words, and then I believe the truth came out. “It’s how I was treated.” Like you, it hurt parts of my life, often made me afraid to stand up for myself, while making me take out frustrations on those I love most. I’m grateful to reach a place in my life where I’m working to break the cycle, ask forgiveness from those I’ve hurt, forgive myself, and work on any bitterness against others for my shortfalls. I’m still a work in progress. So I’m in no position to threaten damnation on any one… I can only share the experience of my wounds, so others will know they’re not alone by a long shot. Blessings from a fellow work in progress! Perry, I think what your father said is very likely true–not only for him but for many parents: “It’s how I was treated.” This is common in all areas of behavior–we learn from our parents. And that is why we should always question whether we should follow their example or do things differently. Gotfried, it is evident that we do not understand the Bible the same way. I would say that the ‘Bible’ does not state anything–clearly or otherwise. The books of the Bible were written by many people who felt a connection with God but wrote from the limitations of their eras, cultures, and inadequate grasp of God’s character. One could say ‘Jeremiah states’, or ‘the book of Acts states’, but not that the ‘Bible’ states because the Bible is simply a collection of books written by human authors. Our clearest understanding of God comes from Jesus who does not teach that God is angry, harsh, or vindictive toward us. God’s character, according to Jesus, is love; God wishes to relieve our fear, heal our brokenness, and bring reconciliation instead of alienation. beautifully put! Of all the many things there are to fear in this life, I am utterly convinced that God is not among them. Surely, he wants us to respond in love to His perfect love, not to accept Him into our lives just to avoid Hell. That is an insurance policy not a loving relationship. Oh, wow…. big topic for me. Relationship with God has been turned into religion. Yes, two very different things… but making people think they are the same. I do believe however that the original biblical texts were inspired by God… but translations have been changed due to various bents. Also, people do not know how to study or read the bible so as to get the original meanings or intent.They have not been taught how to do that. I do agree, Jenny. However, the fundamental relationship between us and our Maker is very, very simple. If, as we believe, it is based on perfect love and not on fear or threats of damnation, then ALL can accept this gift of love without necessarily being clever enough to study the Bible. I’m not saying that the Bible is not important, with much to teach and guide us on our Christian journey, but it cannot be the basis of our faith. The basis of our faith is the Creator God, the person of Jesus and the inspiring power of the Holy Spirit. I guess I am a “Holy Trinity-believing Christian” rather than a “Bible-believing Christian”. I am so tired of being preached at by those conservatives who have cherry picked a handful of texts out of this massive collection of writings and formed them into a religion that is as strident as that promulgated by the Pharisees in Bible times. I also wonder about all the millions of people who attended Roman Catholic churches before the Reformation, where they were told how to behave by the Priests and were preached to and prayed over in a language they did not even understand; who did not have and English translation Bible and who probably didn’t have the education to read one even if they had. Too much emphasis is placed on the Bible, as far as I am concerned – which texts are the Gospel, which are just historical narrative etc. The Holy Spirit is bang up to date, speaks our language and in our context – I’ll take that! Jenny, I like your statement: “I am so tired of being preached at by those conservatives who have cherry picked a handful of texts out of this massive collection of writings and formed them into a religion that is as strident as that promulgated by the Pharisees in Bible times.” Present day Christian conservatives are often very much like the Pharisees Jesus encountered. The biggest reason for this, though, is their misguided belief in inerrancy–that God is behind everything written in the Bible, when in fact the books of the Old Testament were written by people who felt a connection to God but wrote from the limitations of their eras, cultures, and inadequate grasp of God’s character. Jenny, I agree that relationship with God is often turned into religion, but what do you mean that “the original biblical texts were inspired by God”? Do you think everything in the Bible was directed by God? However, we do not have the original manuscripts. So a belief that they were inspired by God is just kinda hanging out there with nothing to hold onto. As far as being taught how to read the texts that we have, my approach is to begin by studying a good translation of the Hebrew Scriptures and try with all my might to not see them through New Testament lenses. Judaism went on to interpret what Christians call the Old Testament in their way and Christians interpreted it in their way. I want to know what the Hebrew says, not what a Christian came to think a passage meant hundreds of years after it was written. For example, almost every element of the story of Adam and Eve as it is offered to the world by Christians cannot be found in the Hebrew text or even an good English one. Steve, I agree with you that we have no original manuscripts of any part of the Bible–manuscripts are fragile. So even if the writings of the original manuscripts were inspired by God, and I don’t think they were, we do have the problems of transmission and, for most of us, of translation if we cannot read the original languages. It is also important, as you point out, that we understand the background to OT books such as culture, history, genre, purpose, and other points of scholarship. However, I think the books of the OT were written by people who felt a strong connection to God but wrote within the limitations of their cultures,. eras, and limited grasp of God’s character. In the NT the gospels were written from the memories of Jesus’ earliest followers, which lends them more clout; and the rest of the NT books were written in the light of Jesus and are very valuable but, in my opinion, are not ‘inerrant’ or ‘inspired’ by God. You write, Tim, that “In the NT the gospels were written from the memories of Jesus’ earliest followers, which lends them more clout; and the rest of the NT books were written in the light of Jesus and are very valuable but, in my opinion, are not ‘inerrant’ or ‘inspired’ by God.” Sounds rather bias to me. There are a couple of problems with the belief that the Gospels have more clout because they were written from “the memories of Jesus’ earliest followers.” One is that we do not know who wrote them and that they were named only in the second century. The oldest manuscripts we have are anonymous. The other is in saying that Israel “felt a strong connection to God but wrote within the limitations of their cultures,. eras, and limited grasp of God’s character.” It seems to me that they did a lot more (so the stories say) than a connection with God. God spoke to Abraham–not just telling him to sacrifice his son but they had a conversation about whether God should really simply destroy Sodom with no regard for the innocent that might be there. God was willing to stop what he was about to do to consider an alternative proposed by a human being. In Exodus 32:14, he did the same when Moses challenged God, except he didn’t just take Moses’ idea under consideration: God changed his mind! God decided not to destroy the group of Israelites. God also spoke to Moses directly through the burning bush. Moses discussed it with God. At one point, he saw God’s face. Yakov (Jacob) wrestled with God. When it was over, God told him, “You have prevailed.” He renamed him “Yis-rael’ (Israel) which means “he who wrestles with or contends with God.” I’m having trouble recalling the parts of the New Testament that illustrate as much intimacy with God. The Hebrew Scriptures describe these exchanges. Paul merely claims he had some revelatory experience. The New Testament, it seems to me, portrays people believing or making claims about God more than having direct experiences with him. Besides all that, the people who experienced Jesus and Paul and the Gospel writers also “wrote within the limitations of their cultures,. eras, and limited grasp of God’s character.” The idea that a son of a god could be sacrificed and resurrected and that people could attain immortality (and salvation) by believing it certainly comes out of the Hellenistic gentile culture and not a Jewish one. Paul was a very Hellenized Jew. Steve, You said: “It seems to me that they did a lot more (so the stories say) than a connection with God.” I think the key here is in ‘so the stories say’. These stories were compiled long after the supposed events, so they say a lot of things that were not witnessed or verified. Did God speak to Abraham? Did God speak to Moses? Did God speak to Jacob? The stories indicate that God did and even include actual conversations, but these stories were written, perhaps including some traditional material, to lend credibility to Israel’s history and existence–long after the supposed events. Steve, can you please clarify your underlying position from which you ask these questions? I find myself having to guess what your point it. My underlying position is that (1) I approach both testaments as collections of documents that do not call for worship or obedience but just are. I don’t think we know exactly what was historical in the Hebrew Scriptures or in the New Testament. And, of course, some things are not amenable to empirical, historical verification. We cannot verify that Jesus’ death was a sacrifice or that he rose from death or that belief in these things bring salvation (or, for that matter if there is a Heaven or immortality). (2) I think that if the only thing someone means by “Christian” is following the moral example of Jesus, they are actually following Judaism, not Christianity, and just don’t know it or want to admit it. Jesus preached some reforms but he did not break with Judaism. (3) I think Paul had a very distorted view of Judaism. Saying that he was Jewish as though that automatically lends credibility to what he says does not work except to firm up someone’s belief in Paul. Deuteronomy 30:8-14 has God saying that following his instructions, teachings or “law” is do-able. Paul says they are not. Who do you follow: God or Paul? Paul talked about Jesus’ death as sacrificial. Jews did not believe in human sacrifice. Jews did not accept Christian ideas about Jesus not because they were stiff-necked, in Satan’s grip or blind but because, for hundreds of years, Jews understood the messiah, whoever he would be, would be a figure of grandeur and power; Jesus didn’t qualify. (4) Sharing stories for forty years until the first Gospel was written (Mark, c. 70 CE) is no guarantee that the stories are true to what happened. In fact, ancients believed stories were meant to become personalized, added to, embroidered. I agree that, for example, the Gospel of John was born of of a Johannine community does not mean it accurately represents what John taught and, even if it did, was what John taught true? The Gospels were composed forty to seventy years after Jesus. I think they are filled with things about him, including some of the things that Jesus says, rather than what he was about himself. (5) There are all sorts of wonderful moral teachers. One can become as as much a loving, compassionate, forgiving person as much by following the Buddha as one can by following Jesus. Or by following Judaism, for that matter, although I would say not in the Orthodox tradition which really is legalistic. Talk about dropping baggage! No having to buy the sacrificial nature of Jesus’ death or the salvific nature of his resurrection. No having to follow the Torah as meticulously as the Orthodox. No mucking up the waters with ideas like the Trinity. No claims that the exemplar is God. That, to me, is dropping unnecessary baggage. I do not believe we are fallen or that Genesis 2-3 says that we are. I do not believe that the type of salvation Christians talk about is needed or was taught by Jesus or other Jews. I do not believe Jesus came for all mankind but for Israel. But Paul added all sorts of baggage on to the historical figure of Jesus and taught to the pagan world. Paul, as far as I know, spun out mythic material which would appeal especially to gentiles. I believe all peoples have their myths–their just so stories–and I have no more reason to embrace the Christian one than many others. Thanks, Steve, for giving me a more solid idea of your thinking. I think, for the most part, yours are reasonable conclusions, and I agree with you at a number of points. But overall, they are not my conclusions. And that’s fine with me; I do not expect everyone to share my conclusions. I did note something seemingly based on a huge assumption: “Deuteronomy 30:8-14 has God saying that following his instructions, teachings or “law” is do-able. Paul says they are not. Who do you follow: God or Paul?” I do see the conflict suggested between these two passages, but ‘Who do you follow: God or Paul?’ seems to assume that God is the source of Deuteronomy 30:8-14. You final line is: “I believe all peoples have their myths–their just so stories–and I have no more reason to embrace the Christian one than many others.” That’s fine with me, too. I do not push my views on anyone; my objective is to help and support those, mostly from conservative Christian backgrounds, who are already questioning things they have been taught. Tim, it’s not an assumption to state that Deuteronomy says what it says. I totally agree with you that neither testament was authored by God. But, given that, I think you would agree that “all peoples have their myths–their just so stories,” I wonder what your underlying assumption is that you point out the non-divine nature of the “Old” Testament yet embrace the NT stories about Jesus’ death and resurrection. If they are not divine, why do you put so much stock in them (more than Deuteronomy)? Steve, I agree that the NT was not written or directed by God. But it was written within a short period after Jesus’ lifetime by people within the new community Jesus started. Tim, as I understand various expressions of Christian belief your downplaying of the significance of Jesus’ death seems way out on the fringe. Of course, mine is too but I am not a Christian. However, I do agree that the resurrection is more significant. I followed the link you provided and many of the comment. There are just too many disagreements I have with what you wrote insofar as their being out of step with forms of Judaism at the time that I can’t believe the claims are sincere expressions of Jewish views but things made up. Steve, I think Jesus’ death WAS significant; it demonstrated that both the Jewish and Roman leaders saw the threat against their power systems. But many believers over the past thousand years have turned Jesus’ death into a sacrifice to satisfy angry God for our sins. This includes Anselm’s satisfaction theory and Calvin’s modification of that theory into the penal substitution theory. These were not the views of the earlier church. You stated: “There are just too many disagreements I have with what you wrote insofar as their being out of step with forms of Judaism at the time that I can’t believe the claims are sincere expressions of Jewish views.” The Jews of the first century thought the same thing, and by the end of that century the Christian Jews were effectively excluded from the synagogues. Jesus’ message did come from within Judaistic thought and culture but transcended that. Paul’s contribution concerning the laws and gentiles further alienated many Jews. I think that, just as Buddhism arose within Hinduism but is NOT Hindu thought, Christianity arose within the context of Judaism but is not Judaism–it is something different. Now I do believe a good understanding of Jewish thought in Jesus’ day helps immensely in understanding Jesus language, context, and his confrontations with certain Pharisees, but Jesus introduced significant difference to current Jewish thinking. Tim, you seem to be ignoring John’s view of Jesus as the lamb of God and his introduction of the Passover theme to make his point. The view of his death was, as far as I can see, was a part of at least one strain of early Christianity. “Jesus’ message did come from within Judaistic thought and culture but transcended that”? What I think are Jesus’ authentic sayings are Judaic, period. In fact, as much as the New Testament puts down Pharisees (tho it doesn’t always), Jesus work more more Pharisaic than it was any other form of first century Judaism. The Pharisees were the sages of the people and helped them interpret the “Law” to help them see how to live by it in new and changing times. To contradict some of their rulings by make healing or gathering crops on the Sabbath hardly is a rebellion against Judaism. And “an eye for an eye” had long since, for the most part, not been taken literally but referred to offering back something proportional in value. Turn the other cheek does not transcend Judaic teaching but might be a progressive improvement. But, many have analyzed Jesus’ mission not as teaching a new, universal moral system but as a push for people to go overboard in their zealousness in keeping the law because the end of days was approaching and he wanted to help Jews be prepared for the Kingdom of God. All that has no necessary connection to Christianity or to anything other than Judaism. I wouldn’t call Paul’s thoughts on the Law a contribution to Judaic evolution. Almost everything he said about the Law misrepresented its character and belied his claims about being a well-educated Jew. In fact, Hyam Maccoby, in his book The Mythmaker: Paul and the Invention of Christianity points out how poorly Paul used Pharisaic forms of argumentation. He concludes it’s ridiculous to think he was a star student of Gamaliel who only accepted the cream of the crop. But also, most Jews considering the Torah a blessing, not a yoke. I agree that Christianity is something different. I disagree that it is what Jesus taught. Steve, this god could not have been very clever if he needed a man to advise him what he ought to do in regard to Sodom, and, in Exodus 33:20, he told Moses he could not see his face and live, yet in Exodus 33:11 it says, ‘Yahweh would speak to Moses face to face, as one speaks to a friend.’ Is this God’s word? Steve, I am aware that Jesus was very involved with the Pharisees and not always in a negative way; Jesus was even called teacher as the Pharisees were. I don’t claim that Jesus opposed the Pharisees but that he opposed certain Pharisees. It seems that some Pharisees supported Jesus before and after his resurrection and were an important part of the early church. But within a few decades of Jesus’ death, the Pharisees (now effectively the ascendant Jewish group and the beginning of ‘normative’ Judaism) did exclude Jesus’ Jewish followers from the synagogue. I cannot say anything about Paul’s relationship with Gamaliel, but Paul did depart considerably from whatever Jewish beliefs he held in the light of his understanding of Jesus. One thing I think very consistent was Paul’s departure from legalism; Jesus prepared for this move in his teachings on the law. I think another very significant contribution leading to something other than Judaism was Jesus’ teaching on the kingdom of God in a way quite different from the Jewish hope and expectation of the restoration of the Jewish political kingdom. Steve, What do you believe? Not much. I think belief is way over-rated. People all over the world have their beliefs about things that, most often, we really have no answers for and myth has long been a way to satisfy people’s longing for answers to the big questions. I believe it is clear that the best way to live with one another is to be kind with one another. For the most part–Golden Rule. After that is refinement and particular peoples’ beliefs. I think the Buddha’s teachings on compassion and ego are at least as useful and beautiful as Jesus. But we do not know for sure how historical the Sutras or the New Testament (or Old) is. The Bible never claims to be from God or inerrant or without contradiction or that it should be read literally. Such claims, it seems to me, are from people looking for power. Well, on and on…. I do think belief is important because how one behaves is often determined by what one believes. So the moral teachings of Jesus are, for the most part, helpful. But that we are fallen or in need of forgiveness or that the biblical God exists or that there is a figure named Satan or that there is a Hell or Heaven or eternal life? I don’t need to have beliefs regarding any of those questions. Steve, our views are not far apart, except that you seem to leave out God from your belief. Does the fact that you hardly mention Him mean that you do not believe in Him? Chas, I don’t formulate the question as you have. Since I have no belief in God, it would make no sense for me to say that I do not believe in “Him” since I have no belief that this male biblical “God” exists. I also think that, if there is divinity, it is not one in whom people would need to believe or that it is the same god that Jews, Christians, and Muslims believe in. I’d think it’d be much more than that. Steve, if there is no God, then the amazing molecule of DNA, from which all lifeforms ever to have existed have evolved, would have to come about by chance. Amazing discussion; wish this could happen in church w/o all hell breaking loose. Takes faith to believe in God, but also takes faith to believe in chance resulting in all we see. It’s a mystery either way. One of the greatest mysteries is self awareness. Otherwise, we’d be like robots. I believe self awareness is one of the greatest evidences for creation by a supernatural power. Nobody has ALL the answers. We challenge each other’s views here because of our uncertainty. Lilly, it would also take faith to believe in chance but most scientists do not believe it all happened by chance by by features of natural law (see TalkOrigins.og). I agree that consciousness and self-consciousness are two of the greatest mysteries. They are the main reason I began majoring in Psychology in 1654 until I soon realized I was in the wrong major and switched to Philosophy. Without self-awareness, I think we’d be more like most wild animals, not robots. And, through science, how it all happened is becoming, VERY slowly, less and less of a mystery. The idea that a supernatural power must be behind creation and, in particular, self-awareness is that, by analogy, we take things as gifts and then posit that a gift-giver must have made them. Even even if there were something to arguments for “intelligent design,” they do not prove the biblical God in any way. They suggest powerful supernatural intelligence but not necessarily of the biblical God. In fact, they do not imply that it is one God or that it (or they) is perfect, etc. Steve, w/o self-awareness, we would NOT be like wild animals. The latest research with MRI shows they, too, have self-awareness. Their brains are constructed much like ours. For years, humans have conveniently avoided this issue, not wanting to believe animals have emotions, etc. Our failure to acknowledge this only emphasizes we as a species are not nearly as smart as we think. Created by natural laws? Where did those come from? Where did matter come from? No, Steve, science is not a even close to explaining it all. We’re only sniffing the tip of a very huge iceberg. I say this as one who loves science. So Steve, do you think that DNA came about by chance, or not? Chas, one of my main points is that, since we do not know how it all happened, why do we try to pin each other down and fit them into a box? As to your specific question, I am not convinced that mere chance has done anything to build the organization, complexity, and beauty of the world. But I do not think the only choices are intelligent design or sheer chance. Steve, thanks for your response. You say a lot of good stuff here–stuff I agree with. I think it is very important for us to be kind to each other, and the golden rule is a good path. I have also been very positively impacted by the teachings of the Buddha, especially on the middle way, attachment, and ahimsa. Even from your list: I don’t believe that we are fallen, or that we need forgiveness as many believers express it, or that Satan exists, or that there is punishment in hell for anyone. And, while I believe in eternal life, I do not believe in Heaven as usually understood. Steve, how can I send you a personal message? Are you on Facebook? If so, you could send me a personal message there. “It seems that some Pharisees supported Jesus before and after his resurrection and were an important part of the early church”? You say this as though you’re talking about historical fact…talking about the resurrection as casually as you would what bread you like best. I have no reason to believe there was a resurrection. You said you didn’t believe the Bible was “God-breathed,” so why take such an extraordinary claim as fact? Like Carl Sagan said, “Extraordinary claims call for extraordinary evidence.” I’ve never seen any. As far as how significant a change from Judaism Jesus’ teachings represented, certainly that depends on where you draw the line. I believe that it makes sense to take all the things coming out of Jesus mouth in the New Testament that have to do with believing in him, only through him, and his divinity are not him but the early church putting them in his mouth. Once you exclude those type of “teachings,” I would agree that some of what Jesus taught represented significant change but nothing revolutionary. If it weren’t for what Paul preached about not Jesus but Christ and similar teachings in the Gospels, Jews might have included him as a prophet. I don’t accept Jews’ not “recognizing” that the Kingdom was not what they thought it was going to be as a lack of recognition. The coming of the messiah and the end of days had long been associated with the expectation that he would (help God) defeat the enemies of Israel, restore the nation Israel, and usher in the Kingdom of God. There is no reason to think they should have been open to it being something very different from that. By the way, I think the way most Jews refer to post-Temple is Rabbinic (sometimes Synagogue) Judaism. It is what became normative in the common era. Though Orthodox and Reform Jews are miles apart on many things, they are both are what they are relative to Rabbinic Judaism. I think the stress on legalism as a criticism Judaism is a caricature. We have no historical evidence that Jews felt like the “Law” was a burden or yoke or that they were in dire need of Christian-type salvation. And, in fact, while much of Christianity prided itself on being the fulfillment of Judaism that superseded Judaism, Judaism kept going very well, thank you very much, except for the oppression and murder primarily by Christians. They lived much better under Islamic rule in Spain in the 14-15th centuries than they did under Christian rule. Steve, the gulf between the Judaic view of the Messiah and the understanding of the New Testament writer(s) from these same scriptures has formed a major stumbling block that has prevented many Jews from following Jesus. The persecution of Jews has also been caused by the NT writers’ errors of understanding, made worse by the behaviour of some rulers of Christian countries. Jews experienced some of their best treatment in Spain, but also some of the worse, during the Inquisition. Chas, I do not see that the Jewish scriptures hold any understanding about Jesus or how New Testament writers or Christians today “understand” Jesus. It is clear to me that none of the verses in the Hebrew Scriptures that Christians invest with Christian meaning have in themselves such meaning. Christians read such meanings into the verses in question. They even pretend that many verses are prophetic when there is no good reason to take them as prophecies. I do not blame Christians for this. Jews themselves (and, I suppose, other peoples) were re-interpreting their own scriptures before the New Testament writers came along. The primary thing I object to is people not owning that that is what they are doing–re-interpreting, embroidering, investing new meaning and, worse yet, claim that what they come up with is the only correct understanding. The easiest example of this, I think, is Genesis 2 and 3. Tim recognizes this one. If you really do read the Hebrew or a good English translation as literally as you can, not reading any meaning into the verses that aren’t there, you will see that it does not say any of the things religious Christians claim it says about immortality or Satan or sin. Steve, because the Gospel writer(s) wrote their Jesus around the erroneous assumption that he was the Messiah, that is how Christians understand him, so their understanding is in also error. The OT writers made the assumption that a king would come as an all-male-line descendant of David, but since David never existed, and they had no way of knowing the future, their idea of a Messiah is baseless. (Sorry the comment below was made in the wrong place). Yes, best under Muslim rule and worst under Christian rule. “The persecution of Jews has also been caused by the NT writers’ errors of understanding, made worse by the behaviour of some rulers of Christian countries.” I believe bad treatment of others might be exacerbated by various factors like “NT writers’ errors of understanding” and “the behaviour of some rulers of Christian countries” but I believe most of it comes from human nature. If it hadn’t been for the reasons you sighted, they would have found other reasons. Chas, there was no Reply link below your post, “Steve, if there is no God, then the amazing molecule of DNA, from which all lifeforms ever to have existed have evolved, would have to come about by chance” so I’m responding here. Non-fundamentalist scientists disagree. There are features in natural law that operate, not just chance. I’m no scientist. But I’ve tried to read some on this. One great place to find scientists’ responses to Christian claims is talkorigins.org. It is an archive of such responses, exploring the creation/evolution controversy. Steve, you still haven’t answered the crucial question: do YOU think that DNA came about by chance, or not? Steve, because the Gospel writer(s) wrote their Jesus around the erroneous assumption that he was the Messiah, that is how Christians understand him, so their understanding is in also error. The OT writers made the assumption that a king would come as an all-male-line descendant of David, but since David never existed, and they had no way of knowing the future, their idea of a Messiah is baseless. The placement of this comment might be “in the wrong place” as you say but below the one n the other location there is no Reply button. Tim, maybe you can explain why sometimes there is no Reply button. “David never existed”? He might not have but what your evidence that he didn’t? I’m curious why a skeptic would still capitalize “messiah.” Doesn’t the capitalization suggest the belief that he was divine? Steve, When the reply button is not there, it is necessary to go back to the last button and reply there. The reply appears at the bottom of that ‘chain’. Steve, Chas is correct about the reply buttons. The comment section is set for only four column indentions so that the columns do not become too skinny to read. In replying to a fourth indention comment one can go up to the last third column indention, which has a reply button that will put the comment at the bottom of the fourth column. Or one can simply begin a new left-hand column by responding the comment option at the very bottom of the page. Steve, if there had been a state of Israel that extended ‘from Dan to Beersheba’, it would surely have appeared in both Egyptian and Assyrian records. It doesn’t. Similarly, there is no sign of David or Solomon in those records either, so there is good reason to doubt that they ever existed either. No assumption should be made on my use of capitalisation. I use it for names and titles. Are you refusing to say whether you think that DNA came about by chance? Chas, “absence of evidence does not imply evidence of absence.” There are many things in the Hebrew Scriptures never mentioned by other cultures and many things about other cultures not mentioned in the Hebrew Scriptures. Well, if we say President So-and-So, we capitalize the title “president.” But if all we are saying is, “We are electing a new president,” we are not using “president as anyone’s title and so we don’t capitalize it. Same with “messiah.” The messiah, it was hoped and expected, would be a Davidic type of person, not anyone specifically. Any assumption I made was based on the use of the English language. Am I refusing to say whether I think that DNA came about by chance? What is this–the McCarthy Hearings? I do not think all things that happen in the known universe happen randomly. Matter works in certain ways, not randomly. But there is always an element of chance that might be at play in any particular instance. So, while I refuse to say that DNA came about by chance, I do not imply that some divine consciousness was behind it. Steve, If it did not come about by chance, then surely it must have been deliberate. Chas, I’m sorry you do not see the alternatives between the two extremes. Steve, no, I don’t. What are they? I am aware that, more and more, we are realizing how self-conscious some animals are. But that is no basis for generalizing to the point of saying “wild animals….too, have self-awareness.” I agree that, for years, we failed to recognize the self-consciousness of any animals. I think robots are not even conscious, much less self-conscious. I don’t know that “natural laws” CAME from anywhere. I’m just talking about the ways matter works. It has certain properties and acts certain ways under various conditions. It’s just the way it is–at least in the universe as we now know it in this tiny point in the cosmos which is our solar system and galaxy. Things happen in certain ways, not randomly, even if there is an element of randomness. Where did all the matter come from? I don’t know and I didn’t make any claims regarding that question. And I NEVER claimed that science is close to explaining it all. What I wrote was, “….through science, how it all happened is becoming, VERY slowly, less and less of a mystery.” How it all happened is slightly less mysterious does not imply that science will ultimately completely eliminate the mystery. I did not study science deeply but I watch documentaries on the Voyager probes, Mars research, etc. and read an article on these matters from time to time. I am fascinated by it and am well aware of how insignificantly small we are. Please read what I (and others?) write more carefully and don’t pretend I generalized about some issue when I didn’t. Steve, sorry I upset you a little; I was on the fly & hurrying a bit. It is, indeed a mind boggling mystery. The atheist is stuck with having faith that a ton of extremely phenomenal things just happened…like winning the lottery a million times in a row…and having no explanation of the origin and/or existence of matter. The religious person is stuck with no explanation a finite mind can determine as to the existence of an infinite God. The agnostic says I don’t have enough evidence to say for sure either way. I want all the answers NOW but can’t have them. Sometimes I envy people who claim to be sure of everything. The most evidence I’v ever experienced was in the worst period of my life, a time of massive problems, a moment when I wasn’t even thinking of spiritual things, when God/Jesus (my interpretation) spoke to me in my head. From that moment on, my life took an inexplicable upturn, & I suddenly had the ability to mend many fences. I’m pretty sure I wouldn’t be alive today if that hadn’t happened. I like discussing all these deep matters, but feel no urge to try to force my experience on others. I’m glad we have unique, varying viewpoints.Peace to you! Lilly, atheists are often much closer to agnostics than people realize. “Atheist” doesn’t imply one is against God or claims to know God does not exists and goes around denying he does. All “atheist” means is “without belief in God” or one who has no god.” So atheists are not necessarily “stuck with having faith that a ton of extremely phenomenal things just happened.” He or she can simply say “I don’t know.” Over the decades, I’ve become less and less impressed by the certainty with which people claim to know things. Chas, you ask what the alternatives are between the two extremes? As I have already stated, matter has properties so its properties act and react to other matter in only certain ways which we describe in physics. Yet, Heisenberg and others have taught us that we always lack complete certainty because there remains, outside the properties of matter and actions between matter, some chance events, including our own observation of them. Obvious, this invites the question (which I suspect you are poised to ask, “Then where did the properties of matter come from? Chance or God? Hell if I know. I could say more if I was an astro- physicist or something. Perhaps my real, base=line answer is that I don’t know. I don’t think you know either. You seem to be saying it could not have all come about by chance and so the only remaining possibility is that a divine intelligence created it. But, first of all, positing a divine intelligence only says who we think did it, not HOW it came into existence. But perhaps the bottom-line point is that we have only begun to understand a few things about how the universe was born and how it operates. For myself, I would feel foolish if I declared the only two alternatives were the ones you stated. “There are more things in heaven and earth, Horatio, Than are dreamt of in your philosophy.” (Hamlet to Horatio, 1.5.167-8). Might that include a divinity? Of course (although I doubt it). Maybe a few gods, maybe some adolescent gods or less-than-perfect gods….I don’t know. Do you? Steve, I do know now that you think it came about by chance. Some chance! You know now that I think it all came about by chance?? You do not know that for that is not what I said and not what I believe. Please read and think more carefully. I said that, along with the way matter and physics work, Heisenberg’s (quantum physics) shows that chance must have also been involved. What is this to you anyway? Are you judging people who DO believe it all came about by chance–either for being ignorant or foolish? Is that your point? Steve, unfortunately, you have not really told us what you do believe. My contention is that DNA is the best proof for the existence of God, whose capabilities are way beyond our comprehension, as the only realistic alternative is that it came about by chance. When asked for a third alternative, you didn’t know one, but you seem to be putting all your faith in there being an alternative, even though you have no idea what it might be. What I believe is that we should be kind, compassionate, forgiving (except that, in many cases, “turn the other cheek” is too unrealistic), and honest with ourselves and others. As far as what I believe about where it all–especially life–came from, I’m curious but think any definitive answer is far far away. I think that the “argument from ignorance” is fallacious. That is like: “It’s so far beyond anything we know that it could only have come from God.” That’s not a valid argument. DNA is the best proof that we barely know what we’re doing, not that God exists. You might think that I’ve not told you what I believe and that you have told me what you believe but what you told me–us–is, in my mind, makes little sense. Apparently, what I’ve attempted to say makes no sense to you. You don’t even recognize when I’ve stated it. Saying the source is God, explains nothing about how it came about. It’s an excuse to not have to explain anything because, whatever it is, God can do it. .
Steve, it seems that the concept of God is beyond your understanding. In regard to DNA, God created it, but how God came to be, that is beyond my understanding. Oh, well, that was simple: “God created DNA.” And there’s the answer. It was right there all along. What’s the problem, Chas? Things tend to happen in certain ways but not exactly the same all the time because there are always contingencies. Makes perfect sense. The waves keep rolling in, the tide comes in and recedes but sometimes there is a tidal wave. Almost everything we know of has constants and is open to to influence from other occasional forces. This is straightforward stuff. Steve, if chance was required at any stage in the production of DNA and life, then chance would be an essential step; i.e. DNA could not have come about without chance. So what I wrote, that you believe DNA came about by chance, is true. I am certain that chance did not play any part whatsoever in the production of DNA, or life. 1. I agree that “….if chance was required at any stage in the production of DNA and life, then chance would be an essential step” but I never said chance was required or necessary. I was only sharing what I, as a lay person, know some things that scientists have been learning. You are not paying attention to the words on the page. Are you speaking as a scientist or a person of faith? 2. Chance wouldn’t be called “chance” if it were required or necessary. It has just been more and more clear that it plays a role. 3. What you wrote– that I believe DNA came about by chance–is false. It seems to have a role but I have no reason to think or write that it is the cause of DNA. Besides DNA itself is not the same and consistent from person to person or within any species. It varies because of chance influences. 4. Insistence that DNA could not have come about by chance does not necessarily lead to faith in a god or in God. It can lead just as well to the conclusion that matter (and whatever else composes the cosmos) must work in certain ways….regularly enough to be described as the laws of matter and physics or at least as Standard Operating Procedure. 5.You are certain. So? In my fifty years of studying in philosophy about the ways people think and don’t think and listening to, reading, and observing people’s declarations of their “certainty,” it has become quite clear that, in most cases, they are not talking about having certain knowledge but are talking about a feeling of certainty. They are insisting that a belief they have is truly knowledge; they believe that whether or not the belief in question is true. “Certain,” in other words almost always means, “I believe it with all my heart.” That’s not evidence of the truth of anything except a psychological state; certainty or feeling certain is not an argument for the truth of anything. 7. Go ahead and have the last word. I’m done. Steve & Charles, I “think” you both have some great points to consider, and are both passionate about your viewpoints. That’s okay. What’s important is hearing other people’s viewpoints to widen our perspectives. I find that when I’m REALLY secure in what I believe, I never feel threatened or angered that someone feels otherwise (unless they directly threaten me). There are times in my life when I’ve felt threatened and angered in a discussion/debate, and I’ve had to admit to myself it’s because I’m not secure in what I believe and am desperately seeking the validation of others. Perry, thank for the post. I think I pretty well understand what you’re saying. I think there have been times in my life when I felt I was in that position. But there are a number of reasons besides this that frustrate people trying to engage in a meaningful conversation. I stated in my last post to Chas why it was getting frustrating for me. You say I’m passionate about my position. I wouldn’t say that. I have a philosophical and mellow bent and, for the most part, am just tying to state my thoughts clearly. Finding this page this morning has helped me so much, you are a blessing, thank you for creating it😍. I was raised Catholic and then was going to a Baptist Church and then back to Catholicism. But the Jesus I been reading about (sticking only to the gospels) is not matching with what is being taught about Jesus. I was having inner turmoil with all the made up man rules, then a few days ago a gay teen tried to jump off a building at school to kill himself because a ” friend” of his outed him before he was ready to come out. It hit me hard and how I cried, so thankful the teachers talked him down but what the heck!!! I can not believe the loving God I know would want this ,don’t care what the Old Testament says. I’m glad to see there is support out there and I’m not the only one questioning. I was feeling guilty for questioning and that I am hell bound for not going with how some Churches teach. Thank you again! Megan, thanks for the kind words; I am glad you found the blog useful. I am sorry the gay kid at your school tried to kill himself for being outed against his will. You said: “I can not believe the loving God I know would want this ,don’t care what the Old Testament says. ” I agree that this kind of anti-gay opposition is extremely harmful and that our loving God would NOT want this. Of course, you know that there are many believers who fiercely oppose LGBTs and they are also likely to say that those, like you, who question beliefs you have been taught by your church are headed for eternal punishment in hell. This can make us feel guilty because we are constantly warned not to think for ourselves but to just accept what we are taught. I am glad you are questioning and thinking for yourself. Let me know if we can be helpful in working through your questions as you continue to do so. Feel free to continue this conversation. So glad you found this refuge from the generally mundane and conventional view of Jesus espoused by many churches. You write, “…I was having inner turmoil with all the made up man rules…” You can start to rest from that turmoil here…. I just want to remind you that Jesus too had a problem with rules; so much so that it seems as though He couldn’t walk out of the house but that He would offend some Pharisee or other — people who believed, as many religious leaders do today — that people are secondary to the rule book. Mark, there is controversy among some about depicting Jesus as white, but there is very little art available showing Jesus as Middle-eastern. I found your blog a few weeks ago during a period of spiritual questioning brought on by participating in a couple of serious Bible studies at different churches that raised more questions than answers. I feel in tune with most of your views and would like to find a local church where I can join more personally with other like-minded people. Do you have any suggestions on how to do that or do you know of specific denominations or churches I should look at? I am in the Reno, Nevada area. Tom, I am glad you found the blog. If you are looking for progressive churches that might think similarly to this blog (not fundamentalist or conservative evangelical), then you might try Disciples of Christ, United Church of Christ, Evangelical Lutheran Church of America, Presbyterian (USA), Episcopal, or perhaps United Methodist. But be aware that individual congregations vary widely within denominations–some can be very conservative. I am interested in your approach of understandiing and knowing Jesus Christ and God I’m the way you seem to have found. Teresa, I have collected several articles written by me and other on understanding and following Jesus. Only read the ones you want, and let me know what specific things you would like to discuss. Most sales training teaches that fear of loss is a powerful tool: Fear that the product you want won’t be available if you wait too long. This tool, too often used by religion to exercise control & extort $, is what turns so many people off. I find JWOB seeks to show Jesus for his love instead of threats. Refreshing yet scary for people raised in a spiritual culture of fear. Later in life, I was a real salesman and refused to use this manipulative too. I wasn’t a very good salesman. Thanks, Perry. I read a lot to the article, though I didn’t have time to read it all. I could really relate to it–both on the prosperity doctrine angle and the cancer angle. When I was younger, I was part of a church that had a strong divine healing focus. We had healing services all the time and the idea was that God (and the preacher) would heal you if you had faith. It wasn’t spoken out loud a lot, but the flipside of that was the idea that if you were not healed in one of the powerful healing services…then what did that say about your faith? As a young man I was infuriated. One of the kindest, loving, Christ-like persons I have ever known depended on arm braces to walk. People often asked if they could pray for him, and he would always agree. He was never healed. And whose fault was that? Well, it wasn’t God’s fault, and it wasn’t the fault of people who prayed for him, so there was only one other answer. This was before the prosperity part of the package was fully in play, but it seems the question is the same: God wants to prosper you and you are not prospering…whose fault is that? I also agree with Kate’s rejection of common phrases used in response to difficulties and death: everything happens for a reason; God is writing a better story; Heaven is your true home; God needs another angel. I know they are meant to be comforting, and I don’t want to take away from someone’s comfort, but they are misguided in my opinion. Again, I really appreciated the article. I think I may have found my people. Thanks for maintaining this forum. It makes sense to me! Over my 59 years I slowly migrated through churches (years each; Roman Catholic > Episcopal > Methodist > Congregational > Lutheran, even a few visits with the Unitarian Universalists!) trying to find a sustainable comfort level. I have said more than once that I wished there was a church that focused squarely on the things that are attributed directly to Jesus. I appreciate being able to check in with you several times a week to get that sense of belonging somewhere. Welcome to the forum, Michele… sounds like you’ve tried to find a church that will feed that certain something you have inside that may have left a big hole in your soul…. you’ll get plenty of food for thought here. Enjoy! Michelle, I am so glad you found us! I join with Anthony in welcoming you to the blog and to the community. Feel free to participate any time you have comments, thoughts, or questions. Come check mine out if you have a sec and any interest! I am glad you found the blog and that you have had a successful journey away from MacArthur; when I was younger I used to read some of his writings. I tried to go to your blog and found two articles from about 10 years ago. Do you have a different blog from that one? –Never mind, I found your current blog. I will take a look! IMO, it’s been disturbing this past week as some evangelicals, one leader in particular, have been dancing on the grave of Stephen Hawking…gloating & giddy that he’s now in hell because he was an atheist. And they wonder why more people don’t want their brand of Christianity. Talk about spiritual blindness. Perry, I agree with you–it’s disturbing! Why would a believer be ‘gloating and giddy’ because they think someone is now in ‘hell’? Even if a person believes in eternal punishment in hell, I think the proper response regarding someone they think is now there would be intense sadness and sorrow. I like to think that Stephen Hawking is in heaven, with his massive intellect, integrity and humour intact but his earthly body pensioned off, doing cartwheels and tap-dancing for joy! The other day I mentioned Stephen Hawking to a Bible-believing christian and her reaction was about the same as that experienced by Perry. All I said was that the good doctor may have been an atheist but now he knows the truth about God — never implying either heaven or hell. This person jumped all over it with comments like “Now he knows better but it’s too late… ‘For man is appointed once to die… and then the judgement'”. She seemed very pleased with herself for having that verse from Hebrews right there when she needed it to show me that she and God are pretty tight, I guess. Her attitude further implied that Stephen was getting just what he deserves. There was no compassion for the human being either as a child of God or as a fellow creature who suffered a great deal in his 75 years of life. It was as though she had somehow won a personal victory through all of this; it is my considered opinion that these people know very little about God and absolutely nothing about Jesus. How sad is that? indeed. It is appalling that some so-called Christians are far more concerned with trying to prove they are right than living a life of love and grace. Ironically, they are not even right! Anthony, I agree. This is sooo sad! Even assuming that the passage is valid, ‘For man is appointed once to die… and then the judgment’, it doesn’t contain all the baggage many folks read into it. Personally, I find it sad that so intelligent a person was not able to see God’s ‘hand’ in the creation of the universe and particularly in the creation of DNA. Yes, Susan… and because they go to such lengths to please God instead of just trying to love Him back as best they can, they lose out on all counts. IMHO, no one who has truly experienced God’s love and grace in his/her life could ever be so cruel and lacking in human compassion and empathy. I humbly offer this observation: that in order for someone to act truly out of a sense of love for others, freely and joyfully putting all of our other needs for personal validation aside, one must know and feel God’s love in their own lives as a living thing… Christ truly abiding in this temple. This should never be relegated to a philosophy, or a religion or, worst of all sacrileges, a firmly held belief… it breaths and lives, and walks and talks only when we have made it into a living act towards others. This is MHO as well. thank you! I could not have put it half so well! The term “personal validation” completely sums up what is wrong with conservative Christianity. I don’t call myself a Christian any longer: I am merely a person of faith in my Creator. Tim, In view of the subject of intolerance, it is relevant to follow this discussion on Steven Hawking with something mentioned on TV yesterday. The subject was intolerance against people in the gay and transgender community, who were dependent on carers. In one instance, a gay man had been confronted by his carer kneeling at the foot of his bed and praying for his eternal soul. In another, a transgender person had been told by their carer, ‘if we were in my country, I would put a tire round you and set fire to it.’ My reaction was one of shock and disgust, but this opened a train of thought concerning openness, and appropriateness of action. In the second instance, the ‘carer’ was open about their feelings. The question is whether these feelings were about the person themselves, or about what they thought about the state (or status) of the person; either way, they came out of the mind of the ‘carer’, not the mind, or body of the person who was being ‘cared’ for. The first instance is not as clear cut, since the one sent to render care to the invalided gay man presumably felt that they were acting, in some way, to his benefit, however, he/she was being open, when to have been hidden would be better. If he/she was concerned about the soul of the gay man, then all that would have been necessary was to pray for them, but somewhere else. Considered carefully, however, it appears that the pray-er felt it necessary for the gay man to see them praying, presumably to make him feel guilty, or in some other way prompt him toward accepting Jesus. But would that be a right way to lead him towards Jesus, or would it have been better to seek an opportunity to speak to him openly on that subject? Clearly, it is my view that the latter would have been better. The other thing that also came to mind was that, if people in a caring and compassionate group are subject to such feelings of prejudice, how much more prevalent must these feelings be in the wider community? If a significant proportion of people are prejudiced in this way, then they will be consciously acting in ways that are detrimental to the well-being of their ‘target’ group, whether that is sexual, gender, or racial targeting. The result is that, even if the prejudice is not openly expressed, subtle signals will be being received by people in that ‘target’ group making them feel as if they are being treated like second-class citizens. Chas, this is sad–so very sad. But I don’t know how to advise a person who thinks a person is estranged from God because of their sexuality. I wonder if these caregivers even bothered to ask the LGBTs in their care if were believers or followers of Jesus. Most likely they just assumed that they could not be. So sad. Charles, your note made me think of what Jesus said: “And when you pray, you must not be like the hypocrites. For they love to stand and pray in the synagogues and at the street corners, that they may be seen by others.” Anyone “carer” who would try to shame others by praying publicly needs to get the board out of their own eye. Thank you. I needed to hear this today. It affirms my conviction that it is possible to love God and follow Jesus in a non dogmatic way. Ellen, I am so glad you found it useful! Hello Krupali, I am so sorry to hear of your feelings of distress. I don’t think God causes us to suffer for his purposes or lays heavy burdens on us. Just the opposite–I think God comes to us in empathy, compassion, and care and desires to heal our alienation and our brokenness. You ask, “How do you guys manage to keep connection with Jesus without following Bible?” I don’t think it is the case that we don’t follow the Bible but that we don’t accept some of the interpretations and conclusions that some people impose on the Bible. I don’t think the Bible is inerrant, but I do think it is very important. I would suggest that the Bible, properly read, does not support the idea that God is opposed to homosexuality. I am attaching a page of articles on that issue. I also am attaching some biblical articles opposed to patriarchy–the idea that women are inferior to men and should be submissive. I hope the article will address your questions. Please, please keep in touch and let me know what else I can do to help and what other issues you have. You can call me Tim if you like. Welcome Krupali… please stay with us a while… it sounds as though you may have many questions and let me assure you that we’re all here for the same reason… we’re all seekers here who want to come to know and love God better but without the baggage of conventional religion. The fact that you’re asking questions tells me that The Spirit is moving within you, perhaps to start to take steps toward understanding some things which you may not have considered before. Judging from your comment, it appears that you may be struggling with trying to reconcile many teachings in the Bible with the character and teachings of Jesus. That’s not a bad start because that’s where many of us here started as well. For now it may just be enough to tell you that Jesus loves you very much… the irony of that statement is that even after many years of study, meditation, and prayer you will find that it will lead you right back to that one simple statement: God Loves You!!! Yes I do struggle with reconciliation. Is it a sin to seek Jesus without the baggage? Does Jesus work in your life even if you don’t follow Bible coventionally? Does Jesus test you like He tests conventional followers? How do I connect with Jesus again? Is the God of Bible going to punish me for involving myself with this blog for my motive is to not follow Bible conventionally? I’m too scared to even make a transition given the situation I’m in. I already feel I’m being tested with the witchcraft thing. By participating in something new that is potentially offensive to Lord, i don’t wanna make my punishment(disciplining by God) worse. Wow, Krupali, I just read Anthony’s response to you! I think it is filled with wisdom and experience and might be worth your reading it again. But in answer to your question of how to connect to Jesus again, let me repeat that Jesus invites us to come to him so that he can give us rest. Jesus is not judgmental and does not ‘test’ us or punish us, though he does give us guidelines for living, which mostly involve loving others and treating them with empathy, compassion, and, care as he does for us. Just accept the invitation from Jesus and begin to ‘learn of him’. That is really what matters. My short answer is No! Unlike what some people think, God is not interested in punishing us–even when we are wrong. But I would like to know what you mean by following the Bible conventionally. How would you describe that? Again, God does not ‘test’ us in any negative sense; neither does God punish us. God wants to heal us of our feat, out brokenness, and our alienation. Can you share more how you are (or were) involved in witchcraft? Hello isestar… thank you for sharing your feelings here… it says a great deal about how you feel about God. Many of us here approached God from a place of fear and trepidation because we failed to see Him as the loving Father that He is toward us all. The journey of coming to know who He is has been a long one fraught with much fear, pain, prayer, and hope; so I can only hope that this will be the beginning for you to see God in a new light. It seems that much of what you have learned about God comes from religion and as many of us have discovered, that can be toxic to knowing the true nature of God. If you want to know what God looks like you must turn and look only at Jesus — read the gospels and see for yourself how gracious and loving He was toward so many who suffered so and as you are obviously suffering now. In fact, He had no standards when it came to loving those who the world despised and labeled as “sinners”… He is not testing us or trying to get us to “do” anything… He only wants our love in return for theFather’s love for us. Try to remember through all of this that He is not “out there” but He is as near as your own heart and spirit. His is the voice drawing you closer… the fear comes from another place not of God. I can easily see that your heart is open to knowing God and loving Him… but looking for Him from the lens of fear will only lead you to a false god…. the one created by religion; and Jesus did not come to bring us a new religion… He came to show us The Father and the love He has for us all. Remember that just before Jesus died He forgave the world for the horrible things which were done to Him… this is LOVE in the purest and highest sense. It is real love for you and me and for all of humanity; and a God who loves so much will never ever leave us or hurt us in any way. You’ve come to see yourself as someone who is defined by the world around you (as so many of us have at one time or another). But this is a lie from hell trying to get your eyes off the beautiful person God created in you… We all have a false self and a true self…. the false self is based on what others around us have come to think about us and what we too often come to think about ourselves…. and this keeps us locked up in a vault of guilt and shame. Freedom comes when we discover our true self — that hidden self known only to God and so deeply loved by Him — and which resides hidden in that little child within and who knows nothing about religion or the false judgements of other people toward you. It is the soft and tender very vulnerable part of your spirit which craves the deep and lasting love which only God can give us. He knows your heart and He will never despise it or hurt it…. if you go to Him knowing He loves you He will begin to heal you…. this all starts with trust (call it faith if you like) but He will not disappoint you. There is so much more that I have to say to you about this but I must confess to you that I feel totally inadequate for the task. I just hope that you can find something in these meager words that your spirit can attach itself to and which you find helpful for your journey as you go forward. God bless you… pray often and remember that He is always right there with you and He will open the eyes of your heart if you trust Him. Does this sound like someone who wants to put burdens on you or make it difficult for you to connect with him? Despite what some believers teach, Jesus is willing, waiting, and wanting to bring you peace and comfort. Reconciliation. By ‘following the Bible conventionally’ I assume you mean understanding the Bible the way you have been taught, which might involve thinking of the Bible in terms of rules and specific doctrines. 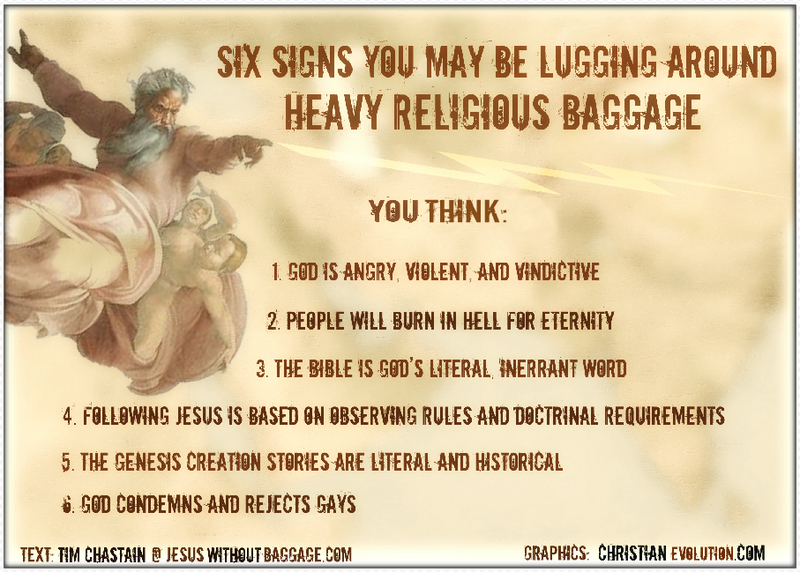 Some of what we are taught to believe is baggage–not imposed on us by Jesus but by those who have harmful, misguided views of the Bible, God, and Jesus. It is not unusual for people who have been taught these things, like I was, to be fearful of leaving them behind. But once a person is more clear in their perspective, the fear should go away. Be assured that we are here to help as you continue your journey. Why do people presuppose that am entity that creates something entirely new has a fundamental, exclusive, and inviolable moral right to destroy what he created—for no other reason than simply the fact that he created it. If I were to build you a brand new set of kitchen cabinets and install them in the kitchen in your home. Well hey!!! I created those cabinets from scratch. I was sovereign (as the Calvinists say) over those cabinets when I created them. Therefore, when you and you wife go out to eat on Saturday night, I am coming over to your house, and I am going to destroy every last one of those cabinets I created with my chain saw. They were my creation, and simply by virtue of that fact, I and I alone have a moral right to destroy them. The fact that I am their creator, and that alone, gives me that right. Where did we get this notion—and how do we attribute it to God—or any other entity for that matter? Are you referring to the story of the flood, or the idea of the destruction of earth at the end time, or the eternal punishment of certain people in hell? Whatever the case, I think fundamentalists and other conservatives see God essentially as ‘angry god’. In my opinion, they are very much mistaken and that is unfortunate. None of those things. I am surprised that this went by you. This idea is pervasive in Judaism and Christianity—and even in our American culture. God created Adam. However, if he had decided to destroy Adam five minutes after he was created, then it would have been morally right to do it if God wanted to—simply because God created Adam. Where does the idea come from that says a creator has no moral obligation to the things (living or otherwise) that he creates—simply because he created them? Think about it. Thanks!!! Perhaps you are right that God has the RIGHT to destroy those whom he created. However, I do not think what you suggest is within God’s character. I think God is a God of love rather than a God of vindictiveness or destruction. I have quite the true personal story which led me to my unpopular and widely unorthodox belief. I know God (I use this word loosely) exists, and I believe that possibly Jesus (Yeshuah?) might possibly also be genuine, however, I do not believe in the myriad bible translation and versions including even the precursors…the Codices. Shawn, it is not a bad thing to question beliefs or even to hold unorthodox beliefs. Honesty is a great place to begin or continue a search for truth. Dogma demands we salute & don’t search. I still occasionally feel a little guilty for searching & questioning, but have to use the brain God gave me to override feelings. Perry, I agree. ‘Do not question’ = ‘Do not think’. I have come to a stage in my life that I am lost in confusion I would love to have a deeper understanding and relationship with Jesus and who he really is not what others perceive.. I am that wrapped up with all the different churches and doctrines and fear , that I don,t enjoy the nature, the flowers the beautiful world we live in because my mind has become a prison and closed because of the controlling teaching ..
Jayne, you are certainly not the only one who has gone through this. In fact, it is quite common. The fear that comes from harmful doctrines is very burdensome, AND the fear of questioning those doctrines is often overwhelming. I went through more than a year of confusion, grief, and despair during one point on my journey away from fundamentalism. Do you have specific issues or anything else you would like to discuss? I am happy to talk with you about them. Perry, I really like that a lot! Thanks! I hesitate to get Involved in social media or whatever you would call a blog like this but I am intrigued by the conversation and choose to enter it. 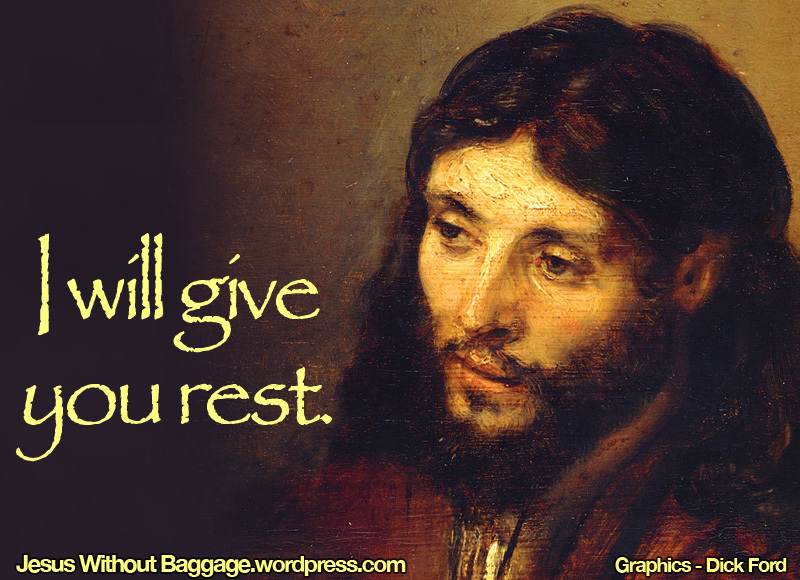 “Jesus without baggage” is an attractive saying to me. My experience with Christianity ( legalistic fundamentalism ) and my knowledge of the Bible tells me that most of the baggage, (a big one for me is hell and eternal damnation) comes from the New Testament including the words of Jesus in the Gospels. Just to make it clear, I am a child of God, a follower of Jesus, a work in progress, broken but not defeated. Years ago when I was still in the middle of what I call my phariseeism, one of my daughters told me that her younger sister who was “straying from the faith” made the statement, “I don’t have any trouble with Jesus. I just have trouble with the Bible.“ At that time I guffawed upon hearing that. Today I am very much in that same place. No trouble with Jesus but a lot of trouble with the Bible. Paul Young’s “The Shack” Played a big part in launching me into a quest of who God really is and what kind of relationship he/she wants me to have with him/her. That quest has led me to this blog. I am definitely not interested in arguing my point or trying to convince others that they should believe as I do. I just want to be in the conversation. Thank you for having me. Wow! I am so tired of going to church to hear about Jesus, and instead finding I’m in the middle of a political convention where leaders keep talking about what “we” believe politically, as though we’re monolithic. And then they finally, as a footnote, get around to talking about Jesus as time runs out. Does this happen to any of you guys? How do you handle it? I don’t want to be disruptive, but I guess I’m going to have to speak up. Perry, I am sorry for your experience. I am sure it is true for very many congregations across the country. If I were faced with that situation, I think I would either speak out against it or leave. Perry, This sounds like a good plan. I do not want to be included in someone else’s ‘we’. I like that you are beginning with a private approach; it provides more opportunity for dialog than calling him out in public initially. But a public challenge could be an option if it doesn’t resolve. Being a new participant in this conversation, I have slowly, because I am a slow reader, been going through the posts. This morning I came across a comment by “Another thinking man“ (ATM) that brought a question to my mind. The comment is at the end of his post on August 30, 2017. It is “One thing I can say confidently now is something I think I read on one of your posts. My faith is based solely in the message of Jesus, nothing more and nothing less.” Earlier in his reply ATM stated that he no longer believes in the inerrancy of the Bible. My question is, where do I find the message of Jesus if not in the Bible? If I pull scriptures from the Bible that support what I believe to be the message of Jesus and ignore all the other scriptures that don’t fit in or support this message, am I any different than the legalistic fundamentalist who uses the Scriptures they need to support their doctrine of an angry, vengeful God who is eventually going to cast most of humanity from all the ages into hell fire where they will be tormented for eternity? What about the holy spirit inspiring people today to write spiritual truth that is not supported by all the scriptures in the Bible? There is a lot of conversation going on today over this question. These questions have probably been brought up in earlier posts but I have not come across them yet. Even if they have I believe they are very important and merit fresh conversation concerning them. Have any of you ever watched “why I love Jesus and hate religion” on YouTube? it’s a good one and goes right along the lines of “Jesus without the baggage“. Thanks Tim for this blog. It is so cool to be able to ask questions and have a conversation that, if done in many church settings, would get one tagged as a heretic and be shunned by other members of the congregation. Hello Heretic…I mean Sojourner (just kidding), you ask good questions. I would say that the Bible doesn’t have to be inerrant for us to find Jesus there. The four gospels tell us the story. They don’t agree on every detail, but I think their picture of the character of Jesus, his teaching, and his action is remarkably consistent. We essentially have a picture of one Jesus not four Jesuses. And the gospels are not inerrant; they don’t have to be. I have several lengthy biographies of Martin Luther King written by different people. There are a lot of differences but they are all about the same Martin Luther King. Some of them might have gotten some details wrong, but it doesn’t matter. I learned from all of them. I believe the Holy Spirit still guides us today, but I think it hubris to say ‘God told me this or that, so it is the absolute truth.’ It doesn’t work that way. I just watched ‘Why I love Jesus and hate religion’ on You tube. I think it made a whole lot of good points. Thanks for sharing it with us. I look forward to hearing from you again as you are so inclined. On the mark, Tim! Especially the MLK biography analogy. Totally different subject: I’m amused by all the people who go on & on about pearly gates, streets of gold, etc. Those things make it obvious such words are written by humans using the most showy earthly wealth they knew to describe Heaven. I don’t care whether Heaven has gold and jewels. I only want to be with all those I love. Period. Perry, you remind me of a man many years ago who had a dream about heaven. Our pastor was so excited about the dream. He had the man describe his dream on stage–it was quite detailed–and sure enough it had gates of pearl and streets of gold. In fact, the dream confirmed everything the book of Revelation said about it. That’s why the pastor was so excited. Well, why should we NOT be excited about that man’s dream? Except, perhaps the dream was influenced by the book of Revelation? Yeah, I know, that is way too cynical. Or maybe the Book of Revelation uses that imagery because it is representative of the spiritual wealth of heaven, which is love and understanding. And maybe in heaven the visuals are representative of the spiritual realities they reflect. Whether or not heaven literally has gates of pearl and streets of gold, the people there certainly do follow paths of love (spiritual gold) and enter through the pearls of wisdom that they have made a part of their lives. Hey Tim, you will probably direct me to one of your articles so I’m just going to cut to the chase with my question. What are your thoughts and beliefs concerning the opportunity for any person to have a post humus encounter with God and Jesus in which they have an opportunity to surrender themselves and enter into a relationship/friendship with them? I believe it is God‘s desire that all would have a relationship/friendship with him. Why would his pursuit of man stop because of the physical death of our body? I very much appreciate the time that you put into this blog and I believe it is helping many people such as myself get out of some pretty stinking thinking involving God, salvation and hell etc. etc. Thanks for the conversation. Well, Sojourner, you are right–I have an article for that. I also suspect that everyone will have an opportunity to accept God’s gift of eternal life after death. Just my opinion, though; I could be mistaken. Thanks for the article Tim and thanks for keeping your articles short and to the point. I say this because I am a slow reader and also because I have had my fill of long winded preachers during my 20 some year stint in legalistic fundamentalism. You made it clear in the article that you are not a universalist. I am wondering if you have ever heard the term, “hopeful universalist”. I came across this term while doing some research into Paul Young’s and Baxter Kruger’s beliefs. They are pretty much in line with your beliefs as far as the idea that there will be an opportunity for all people to surrender themselves to and enter into a relationship with God after the death of their physical bodies. They are hopeful that no one, once they stand face-to-face with God and see his unfathomable love and mercy for them, will be able to resist his invitation. As you pointed out in your article, or maybe I got it from the comments, this is all speculation. We have no idea how long God will continue to pursue people and how many opportunities he will give them to surrender themselves to him and enter into a relationship with him which is what I believe we were created for. I have to go for now and I’m going to send this comment as is but I look forward to continuing this conversation Tim. Thanks again. Sojourner, YES! I describe myself as a ‘hopeful universalist’. I just don’t know if everyone will accept God’s offer of eternal life–but I think it will be their choice and not a punishment. And thanks for noticing that my articles are always short; my standard is fewer than 1000 words per article. I appreciate short articles myself.